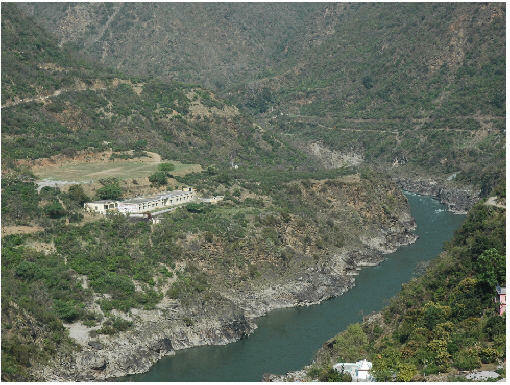 On the Alaknanda River, near Deoprayag, several rooms were constructed for the purpose of running a Degree College which was of utmost need for the people in and around Deoprayag. Due to lack of funds, it was not possible to carry on the purpose of its establishment. Several attempts by the then Management to arrange financial support, failed. The people of Deoprayag, after putting up a request to Shri Swami Omkaranandaji, that He may put His blessed hand for a successful running of a Degree College, decided, that the College would carry the name of Swamiji and whatsoever finished or unfinished construction would be given under Swamiji's control, with the great hope that the longstanding dream will become true. In 1984, with a sparkling inauguration, Swamiji started the great work to fulfil the most urgent need of the people in these hill areas for an ideal College. The appreciations were great and also the Medias praised Swamiji for his generous and selfless actions. The establishment and development of this College were anything but easy. A lot of serious problems had to be overcome in order to build up step by step a full fledged and recognized, as well as affiliated, Degree College. Finally, the sacrifices paid off and the students got a fully equipped Degree College, which was affiliated to the H.N. Bahuguna Garhwal University. For many youngsters, who came from far away villages, the Omkarananda Degree College became an opportunity for higher learning - a shining star in the field of education in the area of Deoprayag. Since the new Government had inclination to establish or provide more Colleges in Garhwal, and since we were entitled for Grant, we decided to handover the whole College to the Government, without demanding any compensation, under the condition that the name of Gurudev Swami Omkarananda will be maintained forever. Today, the College is running as Omkarananda Saraswati Government Degree College, under the H.N. Bahuguna Garhwal University.